The Goodyear Zeppelin Airdock was completed in Akron in 1929, and at the time it was built was the largest building in the world without interior supports. The original designs for the structure were developed by the Wilbur Watson Engineering Company of Cleveland, Ohio. The project cost $2.2 million to complete and provided a huge structure in which "lighter than air" ships -- later known as dirigibles -- could be constructed. Among the first large airship to be constructed here were the Akron (1931) and the Macon4 (1934). The building itself was unique in shape, and was described as "half a silkworm's cocoon, cut in half the long way." 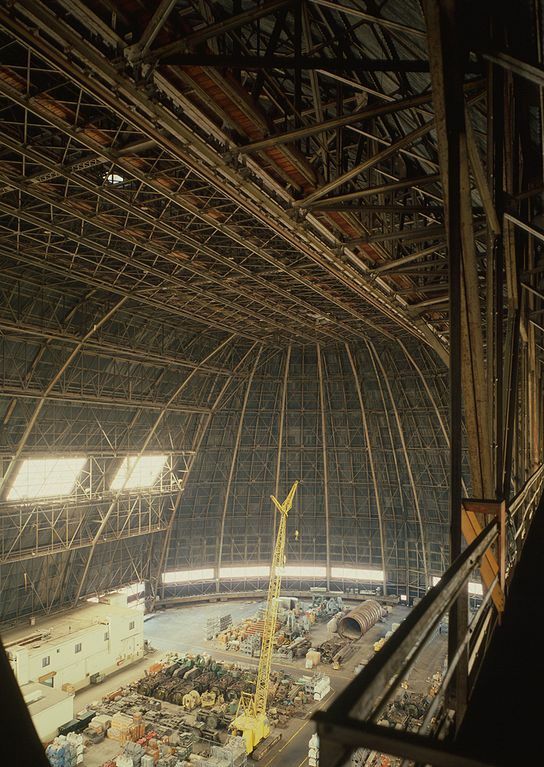 The Goodyear Airdock is 1,175 feet long, 325 feet wide, and 211 feet high. At each end of the building are huge doors that weigh about 600 tons. The doors roll on forty wheels on specially designed curved railroad-type tracks. The Airdock is such a huge structure that temperature changes within could be very different from that on the outside. To accommodate these fluctuations which could potentially cause structural damage, windows were installed, and the entire structure is mounted on rollers to compensate for expansion or contraction resulting from temperature changes. Dirigibles were last built in the Airdock in the 1950s. In 1987, Loral Corporation purchased Goodyear Aerospace Corporation and the Goodyear Airdock. It was then acquired by the Lockheed Martin Corporation in 1996. The Goodyear Airdock is located at 1210 Massillion Road in Akron, Ohio. While not open to the public, it can be seen by those traveling on U.S. Rt. 224 east of downtown Akron. The maiden flight of the American-built rigid airship, the U.S.S. Shenandoah, was on September 4, 1923. On September 3, 1925, she was lost in a storm near Caldwell in southeastern Ohio. Fourteen crew members did including the captain, Lieutenant Commander Zachary Lansdowne. However, one of the ship's officers, Charles Rosendahl, survived by ballooning down in the detached bow section along with a number of other survivors until the bow came to rest on the ground.